Professionals from a variety of disciplines including behavior analysis, psychology, education, social work, speech and language pathology, biology, ethology, and related medical fields interested in using behavior analysis to improve lives and better our understanding of behavior. Being a resource for parents and other advocates dedicated to improving the lives of others through behavior analysis. Promoting the development of undergraduate and graduate students of behavior analysis. Join a group of dedicated professionals, parents, and advocates working to make a positive difference in the lives of others through the science of behavior analysis. At the annual CalABA conference you will have the opportunity to learn about the latest developments in basic and applied research, as well as professional practice. You will also hear about the most recent applications of behavior analytic research to a variety of socially important problems. CalABA members enjoy reduced registration fees for the annual CalABA conference. CalABA is an approved provider of continuing education for Board Certified Behavior Analysts, Board Certified Assistant Behavior Analysts, Marriage and Family Therapists, Speech-Language Pathologists, Licensed Social Workers, Assistant Social Workers, and Licensed Psychologists in California. 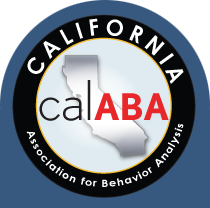 CalABA has adopted the Conduct Guidelines of the Behavior Analyst Certification Board, Inc.. These Guidelines emphasize the responsibility of all behavior analysts to uphold the highest ethical standards of the profession. CalABA membership covers all of California and most of the Western United States and offers members the opportunity to exchange ideas, job leads, research, treatment strategies and professional support. Each year at the annual CalABA conference awards are presented to outstanding professionals, students, and advocates who have supported the work and goals of the Association. There are six main classes of membership: Certified, Professional, Associate, Student, Behavior Technician and Affiliate. As part of its commitment to students and parents, CalABA subsidizes membership and conference fees for Student, Behavior Technician and Affiliate members. CalABA also recognizes Supporting members who contribute additional funds to support CalABA and its activities, including subsidizing memberships and conference fees for Affiliate and Student members. The designation Supporting will be prefixed to the membership designation of any individual in any of the following membership categories who pays additional annual dues of $50. Supporting members are recognized for their support at the annual CalABA conference, in the biannual CalABA newsletter, and on the CalABA website. Click here to join online. 1. Certified: Any person meeting the criteria for Professional member who is also certified by the Behavior Analyst Certification Board, Inc. Annual membership dues: Certified = $83; Supporting Certified = $133. 2. Professional: Any person holding a bachelor's degree or above in any field and who works full or part-time in behavior analysis. Annual membership dues: Professional = $94; Supporting Professional = $144. 3. Associate: Any person holding a bachelor's degree or above in any field and who works full or part-time in a field other than behavior analysis. Annual membership dues: Associate = $94; Supporting Associate = $144. 4. Student: Any person classified as a student in a program of study leading to a degree in behavior analysis or a related discipline, and/or enrolled in a BACB-approved program to meet course requirements for BACB certification. Verification of student status must be provided by an administrator or faculty member of the program in which the student is enrolled. Annual membership dues: Student = $25; Supporting Student = $75. 5. Behavior Technician: Any person holding a credential or certificate as a Behavior Technician and working full or part-time in Behavior Analysis. Annual membership dues: Behavior Technician = $25; Supporting Behavior Technician = $75. 6. Affiliate: Any individual with an interest in behavior analysis who does not qualify for Certified, Professional, Associate, Behavior Technician or Student membership. Annual membership dues: Affiliate = $50; Supporting Affiliate = $100. For questions or additional information about membership in CalABA, e-mail membership@calaba.org.